Hi All…. well my family was able to wrap up harvest last night… but I’m not off the hook quite yet. T’s family has a few more days, so I best do my part to help them finish up!! Since I have been a big ole SLACKER.. I thought I would do a quick post for you all. Its a fun DIY project that I did a while back… but haven’t shared with you all yet. First take the tin lid off your mason jar. Find a drill bit or punch that is close to the same size as the top of your soap pump (where it will sit on top of the lid). Center the lid & create the hole. Then put a very small trace of glue around the top end of the soap pump and put it through the hole to where it will sit on top of the lid. Let it dry. Next I wrapped the top of the soap pump in tin foil. I placed the soap pump lid contraption in an old pop can (makes for a good stand) & spray painted the lid! I used an all purpose spray paint (metal & wood surfaces). You can spray paint the lid prior to placing the pump in the lid, but this is just the way that worked for me. 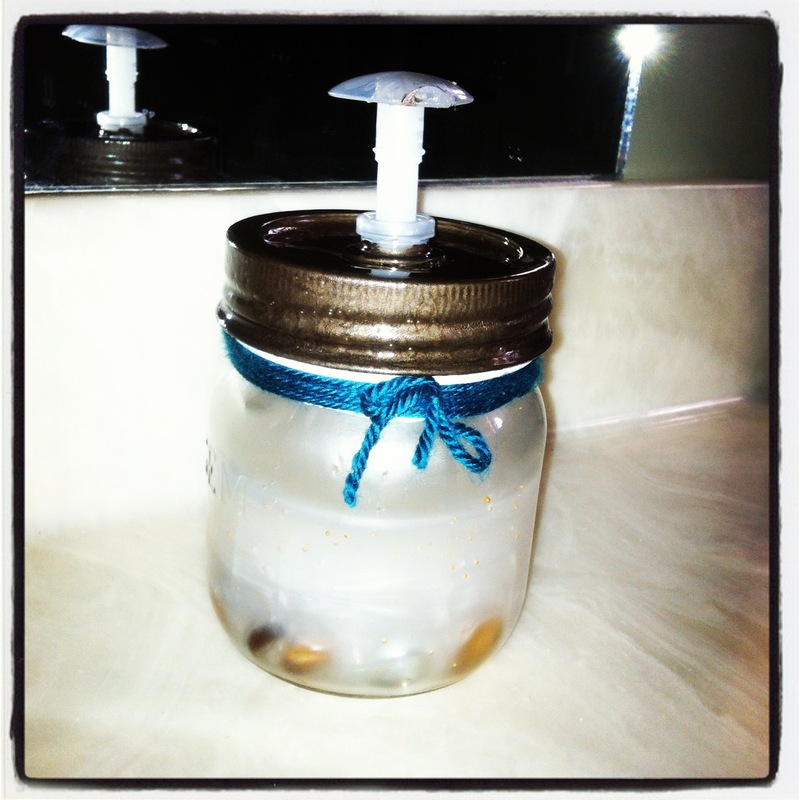 While the paint is drying, I placed a few brown toned glass beads in the bottom of the jar & filled it up with soap. If you choose not to do this is will still look SUPER cute 😉 Then screw the lid back on & there you have it. A cute unique soap dispenser jar for your bathroom. I am going to make on of these for each of my bathrooms, in different colours to match the rooms. Best part is… if you change the look of your bathroom you can just repaint your lid! Also I added some teal yarn around the top & made a cute little bow. Ribbon would look great too!! I apologize as my directions may not be the best… but I’m sure you can get the picture! ← Half Way Through the 30 Day “BE ACTIVE” Challenge! !